Born in France in 1953. As a teacher in United States, he became conscious of the need to lead a « cultural battle ». 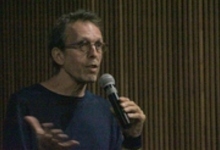 Filmmaker and film critic, he organizes experimental cinema events in France and other countries. After his film and philosophy studies, he became very influenced by contemporary art (Russian formalism and minimal structuralism) and learned music, as well as by his friendship with Paul Sharits. He strives to find a balance between formalism and lyricism. He himself explains that the common denominator between all his films is that they are all constructed according to the principle : « fragility » - « disappearance » - « disintegration». In 1982 he co-founds Light Cone with Miles McKane. Amongst others he has published : Musique film with Deke Dusinberre (1986), "Mots : dites, image" with Miles McKane (1988), Poussières d'images (1998) and finally, "Monter/Sampler" with J.-M. Bouhours (2000).